Kiruna Wagon has been awarded the Swedish Steel Prize 2017 for its wagon system Helix Dumper, which offers a completely new technology for the unloading of fine-grained minerals. High-strength steel has been used both in the wagon and in the unloading station. “Kiruna Wagon has been working with high-strength steel since the start in 2004 and we see ourselves as an ambassador for the technology. To one day win the Swedish Steel Prize has been a dream for us, and we are very honoured to receive such great recognition today. We would like to thank Northland and Robert Näslund and Willy Sundling, who had the courage to invest in this new and revolutionary technology. We aim to continue to be at the forefront of utilising the latest steel and joining technologies in heavy rail transport,” said Fredrik Kangas, Managing Director of Kiruna Wagon. Managing Director, Fredrik Kangas, and Technical Manager, Bengt Bolsöy, celebrating Kiruna Wagon winning the Swedish Steel Prize 2017 – often referred to as the “Nobel Prize of the steel industry”. High-strength steel has been used both in the wagon and in the unloading station and distinguishing features of the system is low weight, high payload and a robust and durable unloading system that can operate at a speed of 25,000 tonnes per hour, i.e. twice as fast as other systems for fine-grained ore materials. During discharge, the body of the Helix Dumper rotates 148 degrees while the chassis remains on the rails. The rotation is powered by the locomotive’s forward motion and the unloading process requires no extra energy. Coupled with the rounded shape of the body, the rotation creates optimal conditions for efficient discharge of even the stickiest concentrate materials that would otherwise tend to cling to the wagon. 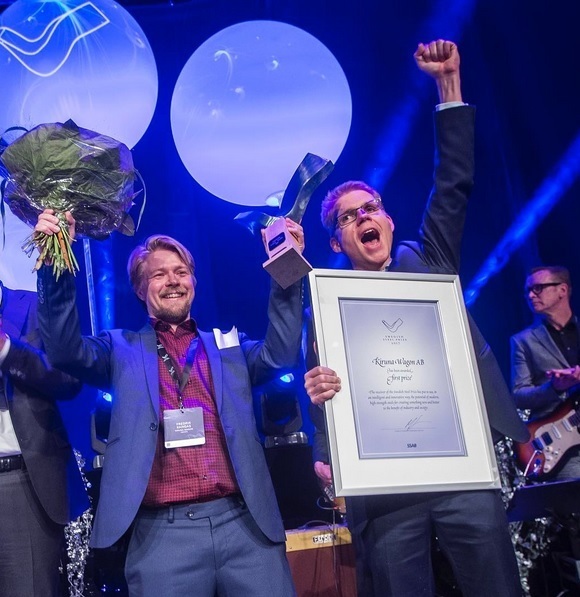 The Swedish Steel Prize was awarded at a ceremony at the Stockholm Waterfront Congress Centre on Thursday, May 11. The other nominated companies were Fermal from South Africa, JMG Cranes from Italy and Wabash National from the United States.